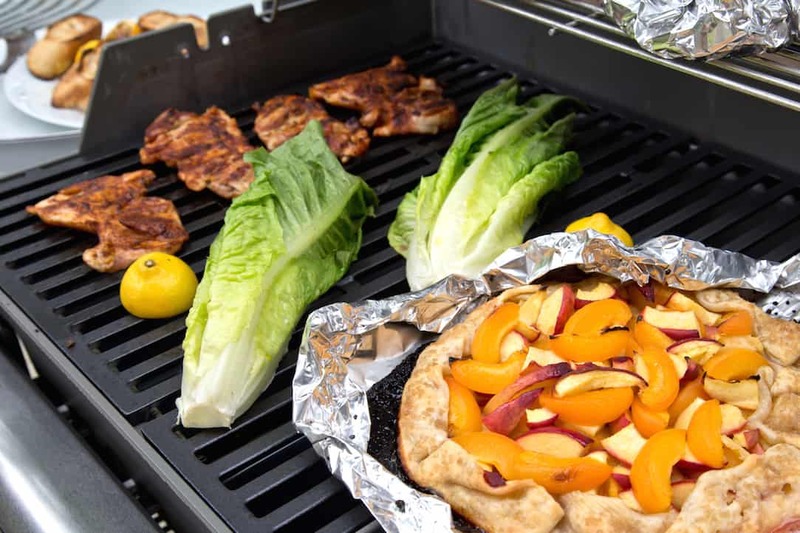 How to Use Your Grill as an Oven or Stove | Good. Food. Stories. Like many of us in the Northeast who bought old houses for their so-called charm and character, I suffer through each increasingly humid summer without the benefit of central air. 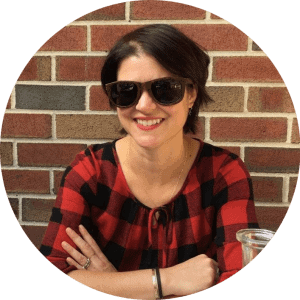 Over the years, I’ve coped in various ways—living on tomato salads and cold noodle dishes, laying and sweating in despair on my kitchen floor while I test a homemade cracker recipe for the umpteenth time. I’ve also started using my gas grill as an oven and stovetop whenever possible. Hey, it’s already hot outside—let’s keep the heat out there if we can! 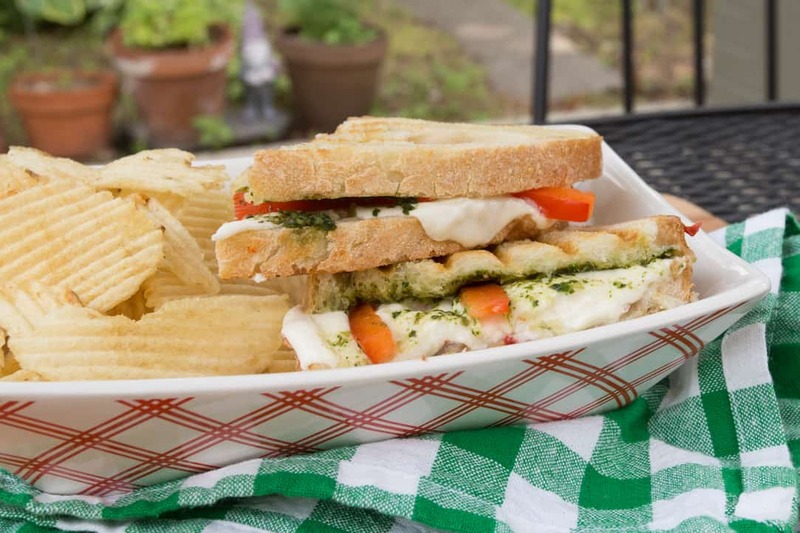 Beyond the usual direct-grate grilling for meats and vegetables, there are a number of ways to make some of your favorite meals on the grill. I’ve shared my favorite method for grilling pizza, and here are three more of my tried-and-true grill techniques for outdoor cooking and baking. If you’re an expert campfire cook, you’ll recognize what I’m doing here. If you’re not a fan of cooking in the wilderness, here’s a way to get the same feel in your own backyard. Everyone loves a one-pot meal, right? So easy, so foolproof! The concept applies outdoors as well: if you can cook it in a cast iron skillet or Dutch oven, you can make it on the grill. Make anything you would usually cook as a one-pot dinner or casserole: spaghetti and meatballs, baked risotto, sausage or beans and rice, chicken and dumpling stew. Keep the grill at medium-low temperatures (300-350 degrees F) or use indirect cooking for best results. Preheat your skillet or Dutch oven, brown your meats and vegetables, then pour in the liquid and grains, then cover the grill and simmer away, stirring occasionally to make sure nothing sticks or burns. 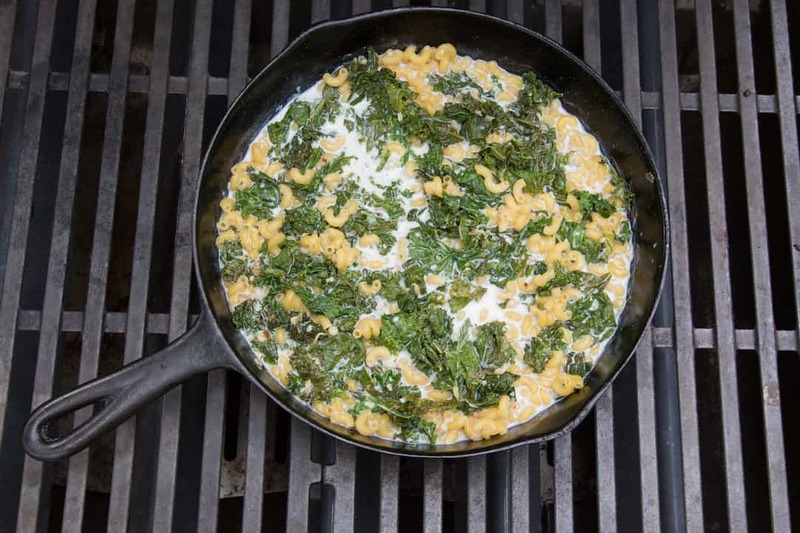 With the abundance of local greens at our farmer’s market, there’s no excuse not to make a cast iron skillet mac and cheese with a ton of kale or your favorite leafy green mixed in. 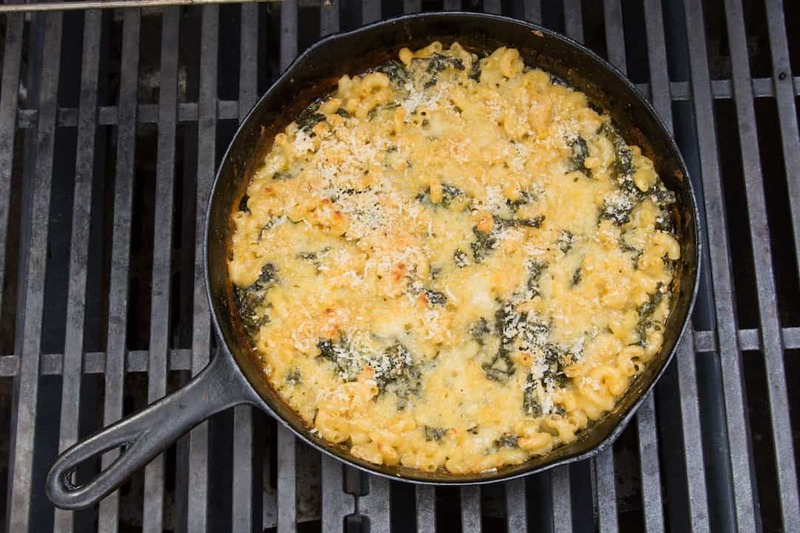 Click here to get my recipe for cast iron skillet kale mac and cheese. Just remember, your cooking vessel needs to have a metal core. Stoneware or glass casserole dishes can’t withstand direct heat and will crack on the grill just as they would if you placed them on a stovetop burner. 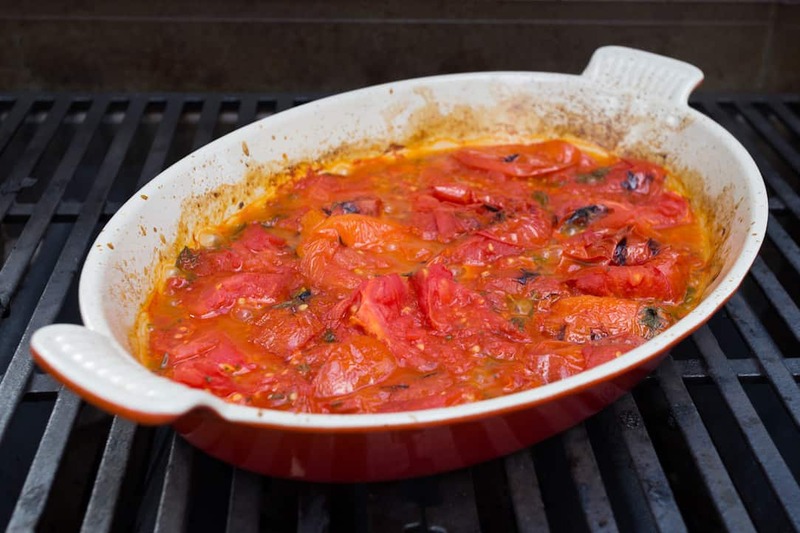 If you want a more traditional casserole dish for grill cooking, Le Creuset makes a version of their popular enameled cast iron cookware in casserole shape. For big-batch cooking, in addition to a cast iron skillet, I often like to bust out the griddle to get the job done all at once. 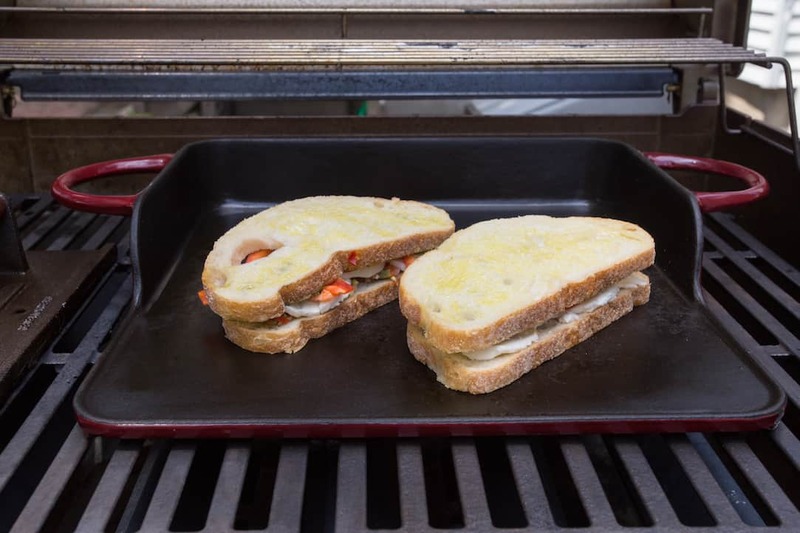 Whether you want to call it a griddle, a flattop grill, or a plancha, placing a cast iron or metal plate over your grates vastly extends the grill’s useability. It doesn’t have to be fancy; the important thing is that it’s large enough to cook a meal for more than one person for efficiency’s sake. Preheat the griddle along with the grill to medium heat (400-450-degrees) before you start cooking on it. You can play short-order breakfast cook and sizzle up a whole package of bacon without stinking up the house, then crack a bunch of eggs or drop a few rows of pancakes with the help of those lovely bacon drippings. Make drop biscuits or sear small, skinny vegetables like asparagus or snap peas if you don’t have a grill basket. Brown up a massive, crunchy hash brown and top with cheese and scallions. Or line up a row of sandwiches for a group lunch where everyone gets what they want! 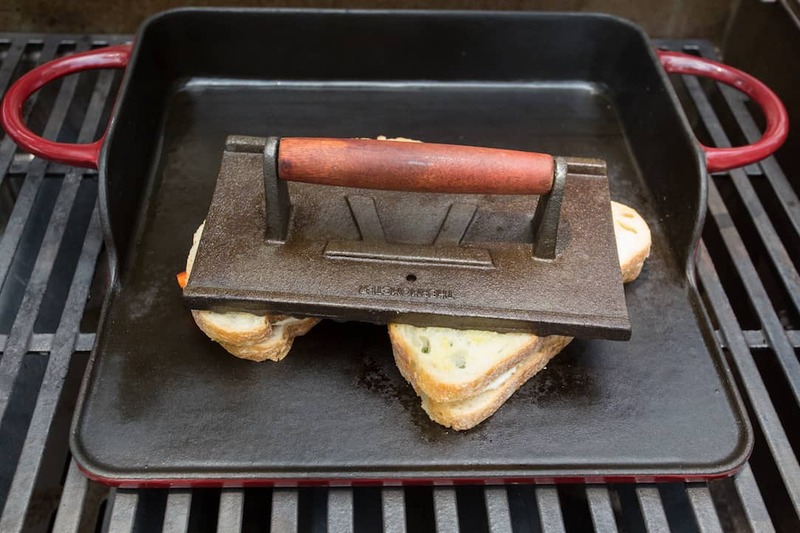 Grab a grill press and preheat it next to the griddle for the best, most truly grilled cheese sandwiches you’ll ever eat. A big old skillet cookie or brownie is always a treat when done on the grill (bonus points for adding marshmallows for a s’mores-y effect.) But when it’s high summer and I’m rolling in peaches, blueberries, apricots, and cherries, that’s where my cravings are focused. And once again, while you can do a quick fruit crisp or cobbler in your cast iron skillet or casserole dish, sometimes a flaky pie crust is just the ticket. And in that case, it’s time to get your galette on. 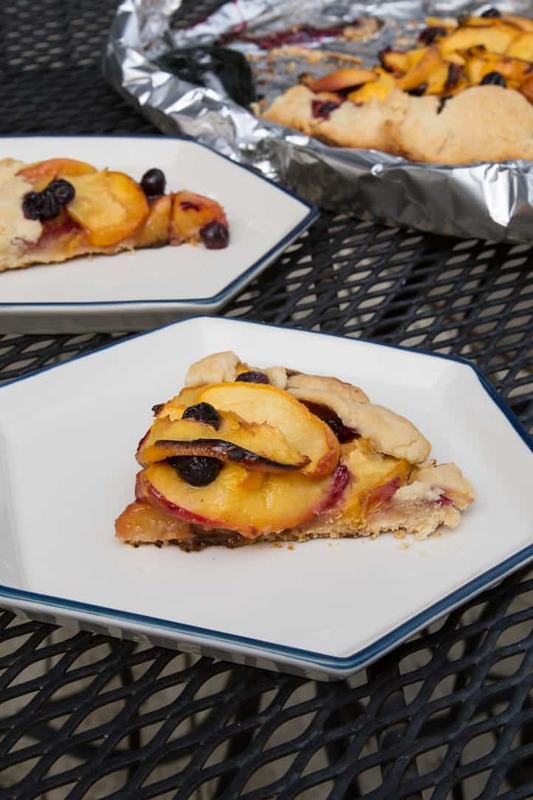 A galette is just the French name for a rustic fruit tart. Instead of baking in a pan, you roll out the crust, dump the fruit filling in the middle, and fold the edges over for a freeform tart shape. Roll your pie crust out (or use store-bought, that’s fine!) and place on two layers of heavy-duty foil spritzed with baking spray. Crimp the edges of the foil to create a rimmed edge, which will catch the inevitable fruit ooze. Go freeform with what you put inside of your galette, too: my ratio is 1/4 cup sugar whisked with 1 tablespoon cornstarch, then tossed with about 1 to 1 1/2 pounds of fruit and a little vanilla extract or other spices as desired. 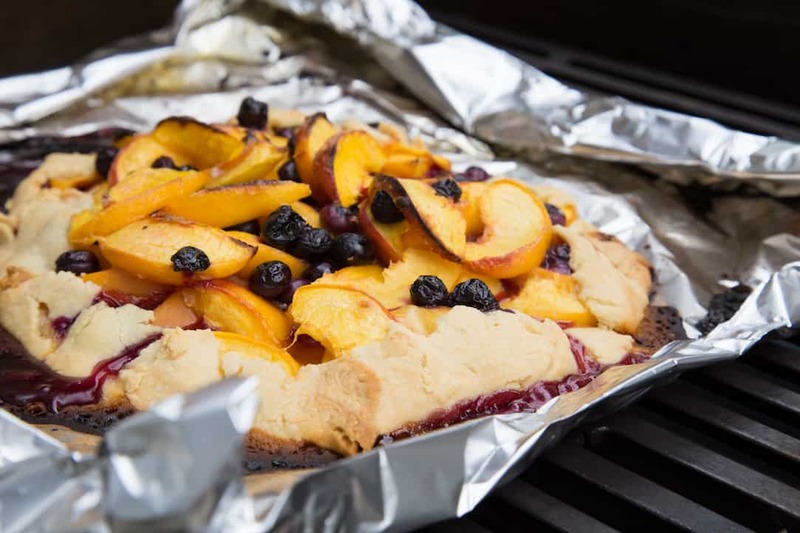 Assemble the galette and place on a grill preheated to medium-low (300-350 degrees F) or use indirect cooking on a charcoal grill. Cover and bake for 40-45 minutes, until the crust is golden and the fruit is bubbly and cooked through. Use these basic but versatile techniques to keep your house cool and your belly full during the dog days of summer. And remember, if you’re too beat to cook, there’s always grilled nachos.